One of the biggest tasks I must face in producing this documentary is the challenge of media management. Not only do I juggle with the task of coordinating videotapes, CD and cassette audio recordings, photographs, radio charts, flyers, handbills, magazines, and even old school yearbooks, I’m also trying very hard to keep up with the task of corresponding with hundreds, maybe thousands of people. When I began this big quest, the internet was not happening, so I relied on a lot of mail correspondence and phone calls. I have a lot of notebooks filled with my scribbled thoughts, and boxes filled with correspondence from a lot of people. I try to keep track of it all, and reply in a timely manner, but it’s often overwhelming. Even under ideal situations, I have a hard time processing everything, and certain items do get pushed aside due to the fact I don’t have as much room as I’d like to keep things nicely organized. Sometimes, I feel like I’ve created a monster. I’m trying to make this a very comprehensive documentary, and I want it to be very rich in content, like a multi-layered novel with many different aspects to it. I don’t have a problem gathering this material, but I do have a problem coordinating it all. One of the interviews I conducted was with Ray Manzarek of the Doors. It wasn’t an extensive interview by any means, as it was done very quickly after a poetry performance at a San Jose State University, and he told me that one of the very first songs Jim Morrison ever performed in public was LOUIE LOUIE. Before the Doors existed, Ray had a band called Rick and the Ravens, and they used to perform at a place called the Turkey Joint West in Santa Monica, California. Ray invited his college buddy Jim to jump onstage with his band and do a few songs. Being the comprehensive documentarian that I am, I decided I wanted to track down more information about the Turkey Joint West, because as far as I knew, nobody else had ever explored this aspect of musical history before. I asked my friend Steve Propes if he knew anyone in Los Angeles that might have something on the Turkey Joint West, and he referred me to his friend Judd Whitcher. I remember it took a few years, but eventually Judd did send me something on Rick & the Ravens and the Turkey Joint West. I received a nice package from Judd, and he included a letter of thanks for the LOUIE LOUIE wine cooler I gave him. I discovered that I misplaced Judd’s package. Earlier this year, when I talked to Steve, he mentioned that Judd passed away, which made me feel even worse. 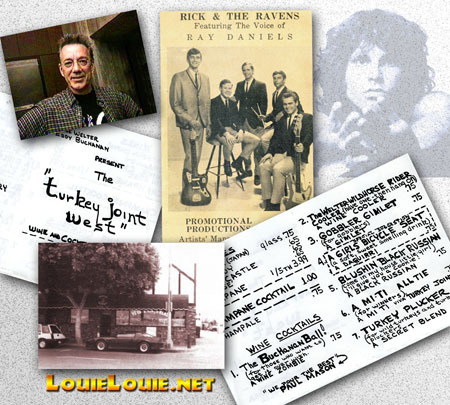 A few days ago, as I decided to do a comprehensive search in my archives, I found Judd’s package, which included a photo of Rick and the Ravens, and a sample menu from the Turkey Joint West. That felt great to be able to find this again. The connection between The Doors, the Turkey Joint West and LOUIE LOUIE is a small aspect of the legend of LOUIE LOUIE, but it’s something that I felt deserved attention. Over the years, I’ve received a lof of wonderful heartfelt letters from some people that were truly touched by the power of LOUIE LOUIE. It was nice to know that this song really resonated with so many people. In the course of my recent search, I re-discovered the Cryptic Tymes and Do the Bop magazines published by Alan Wright. Alan wrote a nice letter to me, and I thought I’d write him to thank him again for his great work. As I did a Google search to see if Alan had a Cryptic Times website, I discovered some very sad news. Alan passed away in 2004, which I didn’t know about until now. My friends at Girl Trouble wrote a really nice tribute to him on a special “Friends We Miss” page, which had some good links to find more more about his life. As Alan was also a drummer with the Earaches, you can read about him at the Earaches webpage. One of the biggest frustrations I’ve had this project is the fact that so many people that have helped me are no longer with us. It is very rough dealing with this, and it’s something I continue to struggle with. I try to be very conscious about acknowledging those that have helped me, dead or alive. I am extremely grateful for the support. So for those of you who I might have inadvertently ignored, my deepest apologies. I appreciate all correspondence, even I can’t always reply in a timely manner. Sometimes, I’m just overwhelmed. If I didn’t express it before, I thank you. Judd Whitcher provided the promo photograph of Rick & the Ravens and the TJW menu. The photo of the Turkey Joint West came from an article about important historic Doors Los Angeles locations by Rainer Moddemann of Doors Quarterly Magazine. The ghostly iconic image of Jim Morrison is by Joel Brodsky, who passed away earlier this year. The image of Ray Manzarek is a frame-grab from my quick little interview with him. The photo of Alan Wright came from the Earaches webpage, and the magazines were sent to me by Alan himself. .. AND if you happen to have a better photo of the Turkey Joint West than the one I borrowed from another webpage, let me know, as I’d like to license it for the documentary. Judd Whitcher was my best freind in H.S. & was the best man at my wedding. I was at the Turkey Joint West the night Jim Morrison jumped on stage and sang Louie Louie while playing the tambourine. My buddy Judd played guitar with Rick & the Ravens for about 1 1/2 years. Was searching the web couple of years ago when I saw that Judd had died of a heart attack at the young age of 60. He was a great guitar player and true friend. I had to laugh when I saw a reprint of menu from the Turkey Joint West that highlighted a drink called a Girl’s Bicycle Seat ( a soft sweet smelling drink ). I was a groupie with the band for awhile. Travelling by van to exotic places like Bakersfield promoting early recordings. The early ’60s were a sweet spot in the history of music. Judd later played solo with Richard Berry at clubs around L.A. County. It’s been a while since I have googled my dad’s name (Judd Whitcher). It was nice to see this post and the kind words of Bryant Fannin. My dad definately had a passion for music. Whether it was making it, playing it, buying it or selling it. I miss him deeply! The doors are legendary. Enough said! Judd Whitcher was my friend I first met him in 1999 played bass behind with Melvin Eddy Blues Band shortly after he went to guitar and myself to bass. Judd always had kind words to say at the right moments, he turn around and say your doing good. Had the time to get to know him and play behind him up till his passing. There hasn’t yet been anyone to play with the feeling Judd had,we were playing a steak house in Fullerton Ca one night Judd hadn’t showed this was before cell phones at least for Judd…..time passed he showed and finished the night he’d ran out of gas CHP got him off the 91 he walked and got gas and made it. He would tell us stories of his days with Rick and the ravens also of his time with the Jimmy Beasley Band…Before his time came actually right before he had made some recordings with Pacific Studios with Ray on piano Jimmie Bott on drums Alex Shultz guitar, Victor Gutierrez harp Steve Samuels guitar Judd on guitar and all vocals and of course Bill Stuvie on bass…just a quote on Judd’s Boogie tells how he was as a person:I would like to acknowledge and thank all the players for their outstanding performances, on this my first recording-Judd Whitcher…That night will always stay in my memory when at Martini Blues Rod Piazza and the mighty flyers were playing Judd and I went together Judd wanted to give Bill Stuvie the recordings they had made together so long ago, it was cool for me he introduced me to Mr.Stuvie..We played alot of gigs together we all loved him dearly and miss his calm and collective manner he had about him never anything negative about anyone. On occation he spoke of his enlarged heart but knew the risks through the years…The recordings he gave me and the love to the band will always stay with me. I don’t care for solos as a bass player we work hard already running the neck but he would say just pluck the strings like Stuvie…he’d say less is more…and wish that sound guy would just set the controls straight up and leave it alone…another one he would say was just run clean through the amp you don’t need all those pedals….My faith thru Jesus assures me I will see him again along with my father…the last song Judd played was a Elmore James tune The Sky Is Crying and he played with a slide awsome song also the first time I heard him on slide and this was at at Halloway Studios in Santa fe Springs Ca. Thanks to this website for letting me acknowledge a true musician who enjoyed music and people. I lived a block away from Judd Witcher from 1957 thru 1968 or so. I worked with him at a drive in dairy in Gardena, Calif. for a couple of years. His first car was a 1936 ford coupe, then he changes to a 1937 Ford coupe. His next car was a a 1957 Studebaker golden hawk. He was always practicing on his gutair even then. His little brother, Rodney put an engine in the truck I had back then. Judd was a great friend to me. Judd also played with my dad Roland Biscailuz.